Rohit Sharma’s (133) heroics went in-vain as an all-round Australia defeated India by 34 runs in the first One-Day International (ODI) at the Sydney Cricket Ground (SCG) on Saturday. After winning their first Test series in Australia, Indian cricket Team led by Virat Kohli was geared up for the first One Day International (ODI) at Sydney Cricket ground. Australia skipper Aaron Finch won the toss and elected to bat in the first One-day International against India today. The hosts have handed debut to Jason Behrendorff. Virat Kohli is leading Team India in ODIs after a span of nearly 6 months as he was rested for Asia Cup 2018 and against Windies. Rohit Sharma’s return after missing the Sydney Test is likely to boast Indian Batting line-up while Indian team management needs to maintain the balance of the side after Hardik Pandya suspension over his controversial ‘sexist’ remarks. Being asked to chase down 289, India found themselves in a spot of bother, when Shikhar Dhawan, skipper Virat Kohli, and Ambati Rayudu were dismissed with just 4 runs on the board. But Sharma added 137 runs with MS Dhoni to take India to a safer position in the match, and then carried on to stick in the middle with Dinesh Karthik after Dhoni’s fall. Earlier, Australia had scored 288/5 in 50 overs after electing to bat. With the track at Sydney Cricket Ground expected to get slower and lower, Australia found themselves having the best use of the surface. However, they got off to the worst possible start as skipper Aaron Finch was castled by a terrific delivery from Bhuvneshwar Kumar. 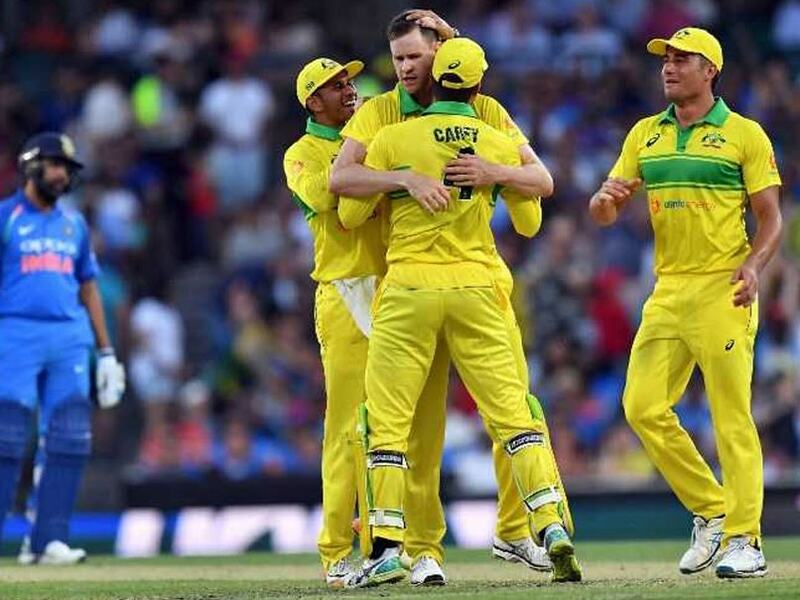 Following the dismissal of wicket-keeper batsman Alex Carey at the hands of Kuldeep Yadav, Usman Khawaja and Shaun Marsh got together to repair the innings. The duo compiled patient half-centuries to drive the innings forward against some relentless spin bowling in the middle-overs. However, India struck back by halting the progression of both Khawaja and Marsh. Sustained pressure from the seamers ensured that the Australian batsmen were up against it when the death overs began. Peter Handscomb batted impressively and helped the hosts revert pressure on the Indian bowlers. He latched on to even the slightest of errors from Kuldeep. His rapid half-century played a key role in pushing the total close to the 290-run mark.Here are six of the most interesting passages of play from Australia’s innings at the SCG. Credit to them, they gave us a run for our money in those middle overs. When you have a team three down early, it becomes difficult to bounce back. I am very happy to get (Kohli’s) wicket, but more happy with the win. As a bowling unit, we are clear about our plans, doing our homework and being professional out there. I think it was about assessing the conditions more than anything else. Felt like bashing the wicket was quite difficult here. In the end, it became easier to bowl with the softer ball. My finger’s fine. Yeah, very pleased with the performance. We needed to take it deep with the ball and took the wickets at the crucial time. I thought we got a par total, Peter played a gem. In the middle period we played really well. We didn’t score a lot of runs in the middle overs but we saved the wickets for the final overs. Jhye and Jason are full of confidence, they both have a good future ahead of them. We can always improve, it will be a good series. We are not very pleased with the way we played. I thought we could have done better with the tempo of the game. It was a 300+ wicket. We thought 280 was chaseable. Rohit was outstanding and MS supported him well. They took the game deep, MS got out at the wrong time. If we would have had one more partnership, we would have been close. Rayudu got a good ball, Shikhar was out on the first ball and I hit it sweetly but straight to the fielder. The defeats like these make you aware of the things you need to improve on. कूल कैप्टेन धोनी मनमौजी भी थे !